Presidential spokesman Aimal Faizi said that President Hamid Karzai had ordered the ministry of defense to kick out the US Special Forces, which he accused of fueling “insecurity and instability” in the volatile provinces, which are close to the capital Kabul. “The US Special Forces and illegal armed groups created by them are causing insecurity, instability, and harass local people in these provinces,” Faizi told a press conference. A further statement released by the Afghan president’s office said that the decision to expel them was made by the National Security Council. “After a thorough discussion, it became clear that armed individuals named as US Special Force[s] stationed in Wardak province engage in harassing, annoying, torturing and even murdering innocent people," it said. "A recent example in the province is an incident in which nine people were disappeared in an operation by this suspicious force and in a separate incident a student was taken away at night from his home, whose tortured body with throat cut was found two days later under a bridge. However, Americans reject having conducted any such operation and any involvement of their special force. The meeting strongly noted that such actions have caused local public resentment and hatred,” the statement continued. He also said that there was alleged involvement of Afghan civilians working alongside US Special Forces. "There are some individuals, some Afghans, who are working within these cells, within these [US] special Forces groups in Wardak province", said Faizi. The Wardak province is seen as a gateway for the Taliban to attack the capital Kabul and the accountability of US Special Forces and the local militias who work alongside them, has been a source of friction between Afghan US relations. The number of civilians killed from airstrikes dropped by nearly half to 126, according to figures released by the UN Mission to Afghanistan last Tuesday. While the number of civilians killed by drones jumped by 72% to 16. Last week Hamid Karzai also banned Afghan forces from calling in NATO airstrikes on residential areas, following the deaths of 10 civilians on a raid in the eastern Kunar province. “Our forces ask for air support from foreigners and children get killed in an air strike,” Karzai said in a blunt statement. This will be the first time that Afghanistan’s 350,000-strong security forces will not be able to rely on NATO airstrikes to help them carry out military operations. The International Security Assistance Force (ISAF) has said that the majority of foreign combat troops will leave Afghanistan by 2014, with the US and the UK already beginning to reduce troop numbers. This has sparked fears that Afghan security forces will not be able to maintain security within the country. However, Karzai has shown no concern for the imminent withdrawal of foreign troops and has said he is convinced Afghans will be able to handle their own security. “We are happy the foreign troops are withdrawing from Afghanistan. I have been arguing with the foreign troops, don’t bombard our houses, don’t go into our villages, don’t disrespect our people and we hear our forces partnered with foreign forces are violating human rights,” he said. 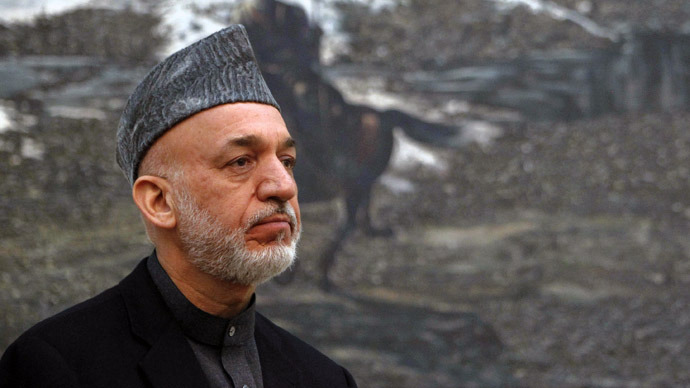 In December last year Karzai also blamed the US for corruption in Afghanistan. In an interview with NBC at the presidential palace, he said that contracts issued by the international community and in particular the US were to blame. “Part of the insecurity for us is coming from the structures that NATO and America created in Afghanistan,” he said. The increasing assertiveness by the president in relations with the US could be explained by the need to project an image of power and security to his country. Adjunct Professor of Politics at New York University, Patricia DeGennaro is convinced that "he's trying to make a statement...an Afghan leader needs to show that he's there for the people and can get the people on board in order to support him." That is in reference to the special forces expulsion. And the people will require that certainty, knowing that they have to be ready to hold free and fair elections in 2014. Nonetheless, DeGenarro also believes that "we underestimate President Karzai's power, he has a lot of influence and has been able to maneuver well between different tribes and players. So I'd give him more credit than we've given him, but it's really difficult to maintain power in that region, as we've seen in history, so he's going to have to show that he has a little bit more support from his nation rather than just his region within the south." However, she doubted that Afghanistan was ready to take over its own security after NATO withdrawal: "Its army is known for a lot of defections, there hasn't been a lot of continuous training throughout the last ten years or so...different types of training...the police was trained like the military...I just don't think the country has shown that type of unification and I don't think they're ready for the future."